The Basset Hound of Southern California, Inc. publishes a monthly newsletter called Basset Tales via email. Kay Haggard is our current editor. If you are a member of the BHCSC and have not been receiving your newsletter every month by email please contact Kay. Kay does a wonderful job of keeping our membership informed. 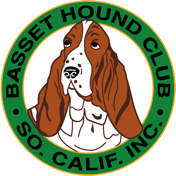 Basset Tales provides a lot of information about the club's upcoming activities, meeting dates and times as well as information on all upcoming club events. In addition Kay shares pictures and results of previous club events. Our members have a section where they can brag about their basset's accomplishments in AKC sanctioned events. Many months there are articles submitted by our members or others on topics related to basset hounds. Members are encouraged to submit material and pictures to Kay Haggard for possible inclusion in Basset Tales. Our president also shares a message in each issue.